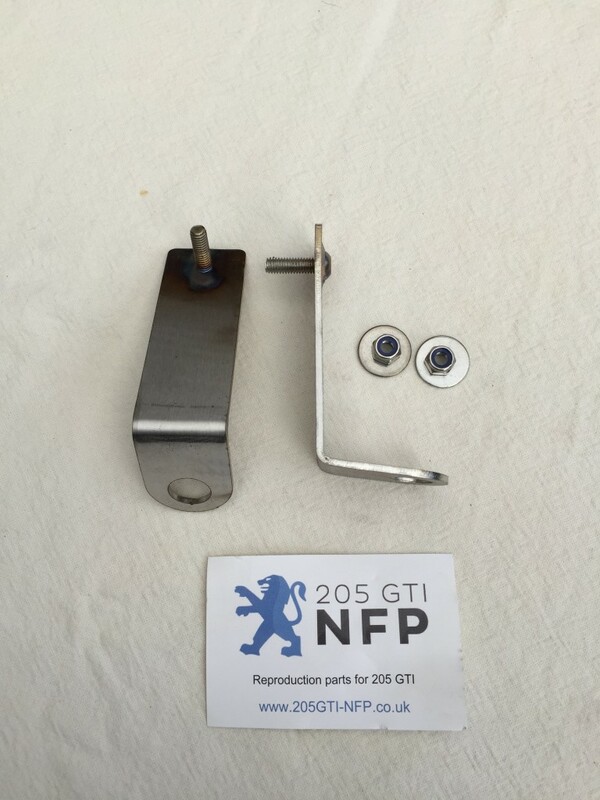 205GTI-NFP can now offer you a reproduction front spotlight bracket for your 205 GTI and CTI. These Driving Lamp Support Brackets are made from 2.5 mm stainless steel with stainless bolt TIG welded on and supplied with stainless nyloc nut and penny washer to fit to your car. This bracket is now NFP from Peugeot with apparently none or very few left on the dealer network. Often looking quite sorry for themselves or sometimes missing or with sheared fixings, these brackets go from the front panel to the spotlight mount stud to stop the spotlight vibrating about on the front bumper plastic valance. The price for these brackets is £25 per pair including UK post.